William Tyndale, before being strangled and burned at the stake, cries out, “Lord, open the King of England’s eyes”. 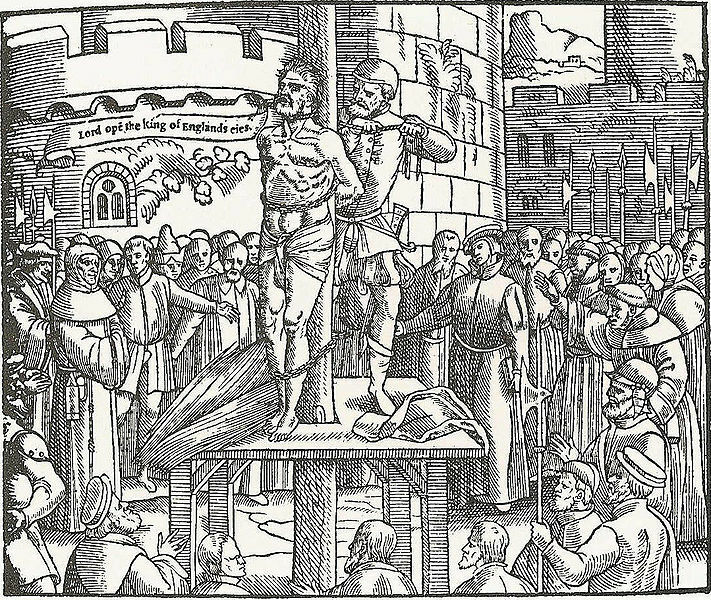 woodcut from Foxe’s Book of Martyrs (1563). Interestingly, there were no submissions about the gigantic elephant in the room, John Calvin. However, he was a big topic in our discussions today of course; most of the topic focusing heavily on the doctrines of predestination and limited atonement. In the course of our discussion, it seemed evident for the most part that we either flatly rejected those two doctrines or had serious questions about them. In the upcoming weeks, look for more extra thoughts on Reformed theology and Calvinism by others in the group. Though I do like our approach in tackling topics that we weren’t that familiar with before like Anabaptists and the Book of Common Prayers. For the most part, we’ve been part of the Presbyterian Church and or surrounded by the Calvinism that is so prevalent in our church lives for so many years that we wanted to tackle other lesser known material. When you recycle stuff you already know well, things get somewhat stale or boring after a while. We also explored the question on whether or not the Reformation was necessary. Most in the group agreed that it was necessary because of all the corruption by the Catholic Church. Although, it was at the expense of where there was no more centralized authority and bringing the Bible to the masses by translating it into the common vernacular, as Luther and Tyndale did, led to personal/private interpretations of the Bible, which of course led to gross misinterpretations of the Bible as well- then that produces misleading and overly complex and unnecessary doctrines as well. And of course, one of the major aftermaths of the Reformation was that it would spawn over 42,000 different Christian denominations worldwide. There are some who believe the Reformation should never have happened and others who say that it was inevitable and necessary happening for the benefit of Christendom overall. By Project Augustine in Church History, Reformation, Theology on May 4, 2014 .